FreelanceEngine 1.7.12 Is Rolled Out, Improving The Complete Project and Dispute Flows! FreelanceEngine 1.7.12 has been released with new changes in the complete project and dispute flows. Other improvements and bug fixes are also concluded in this version. From now on, a project will be marked as “Completed” right after employer reviews and rates for freelancer. It means that freelancer isn’t required to review and rate for the employer as before. Workspace is accessible at any time, even when the project is already completed. [Workspace] Attached files are separated from the chat box. Instead, they are separately shown on the right sidebar for easy following. [Workspace] Re-style the conversation chat box. Re-design the finish project modal. A new button linked to workspace is added, allowing employer and freelancer to review the working process of a completed project. After the project is completed, both employer and freelancer cannot send or delete any messages as well as attach any files. Notification is seamlessly sent to freelancers once their working project is completed. Money is transferred after employer reviewed and rated for freelancer. Manual transfer function for Credit & Stripe Escrow is available. Remove the Stripe fees option. The dispute feature will be automatically disabled when you turn off Escrow system. Seamlessly display the status of a disputed project (Disputed & Resolved). Both freelancer and employer can access the workspace during and after project dispute. However, they cannot send messages or attach files. Freelancer, employer, and admin can review reports given by two parties as well as the admin’s decision after dispute. Re-design the project detail page of a disputed project for better display. From now on, admin has to click on the “Arbitrate” button to resolve the dispute from the front-end. New resolve dispute modal for admin to resolve the dispute, including a comment area and options for money transfer. Email is seamlessly sent to both freelancer and employer after admin arbitrated. Re-design the credit tab in the user’s profile page. Show notification for no results filter in the projects/profiles page. Adjust the appearance of the project milestones in the workspace. Change text in the About Employer block. Rating and review seamlessly display in the employer’s public profile. Bugs involved in payment gateways, Stripe calculator, Stripe Escrow, localization feature, package plan, etc. are also fixed in this version. Along with FreelanceEngine 1.7.12, Stripe Escrow 1.2.2, FrE Milestones 1.2.2, FrE Private Message 1.1.8 and FrE Credit 1.1.7 extensions are also updated to the latest version. 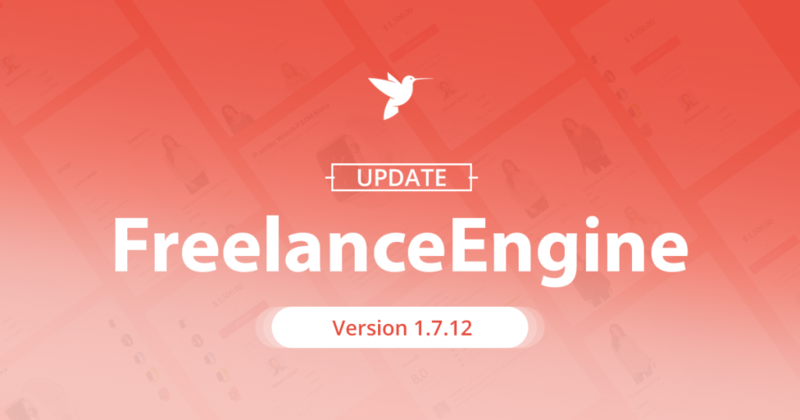 Above are all new changes and bug fixes in FreelanceEngine 1.7.12. If you have any questions, please contact support@enginethemes.com. is database affected as well ? Regarding your question about how to upgrade FreelanceEngine theme, kindly visit our documentation http://docs.enginethemes.com/article/469-updating-the-latest-version. You can update your theme via either your back-end or your FTP account. Should i update then it manually? Regarding the problem, we’ve already fixed, and everything runs well now. Kindly check it again and let me know if there are any problems. Auto-update is now available. Kindly check it again and let me know if there are any problems. An error occurred while updating FreelanceEngine: The package could not be installed. The package contains no files. Can you send us your site’s license via our email contact@enginethemes.com so that we can check the problem? We’ve checked and fixed the problem. Kindly check and update your site. You guys consistently bring out powerpacked features and upgrades. I love it! Keep up the good work on this theme. It’s getting more and more powerful with each new feature. Hi there, our site has never shown the auto-update even though we have our license key in the settings? Regarding the problem that you’ve encountered, please send us a ticket by choosing “Technical Problems?” section at https://www.enginethemes.com/help/ with your site account. Our TS will check and assist you in solving it. Broke my theme! Usually when I go to /profile page and I am not logged in I get the login/register form. Regarding the problem that you’ve encountered, please send us a ticket by choosing “Technical Problems?” section at https://www.enginethemes.com/help/ with the screenshots/video of this issue. Our TS will check and assist you in solving it. I created ticket directly after your response but no reaction. We know you have delayed support now but would have been nice to get response within 24hours because that was before the delayed support started. Really need a working website again.